View from the Museum entry, as the cases are assembled. After months of planning, the staff of the Bookbinders Museum–and the curators of Books and Mud: the drowned libraries of Florence–arrived at this week barely believing that the time had come to put everything–the text, the photos, the special materials–together. Working with exhibit curators Tom Conroy and Elizabeth Ryan, ABM librarian Elspeth Olson (with the able assistance of library volunteers George Carlson and Mara Crovello, and all-hands help from museum staffers Stephanie Stokes and Madeleine Robins) assembled the many parts–over 100 photos; books, magazines and maps–in an attempt to evoke the essence of the 1966 Florence flood, its aftermath, and its lasting effect on book conservation and restoration. Practically speaking, this involved the use of ladders, duct tape, the Museum’s Hickok board shear, 133.3 square feet of mat board (white and cocoa brown), burnishers, vinyl lettering, and an extendable pole (for hanging fishing line strung with folios). As the photos seen here attest, it was a slow, deliberate process. Quotation over the entrance to the exhibit room. We hope that visitors to the exhibition will be struck, not only by the world response to flood and its threat to world treasures in 1966, but by the relevance of the subject fifty years later. 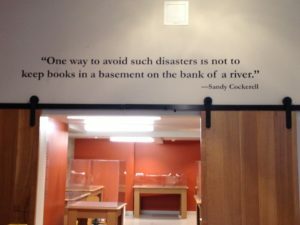 In a world where countless floods have threatened libraries, museums, and collections world wide, the lessons of Florence are more important than ever. 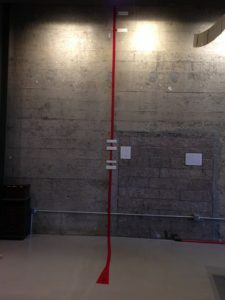 Tape climbs the wall to show the depth of Florence floods of various years; the 1966 flood reached a depth of 22 feet–taller than the ABM ceiling. Cases in position for the exhibit opening. 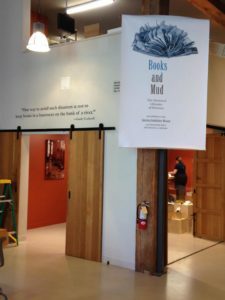 Books and Mud: the drowned libraries of Florence, runs October 20, 2016 through January 20, 2016 at the American Bookbinders Museum, 355 Clementina Street, in San Francisco. The museum is open Tuesday through Saturday from 10am – 4pm. 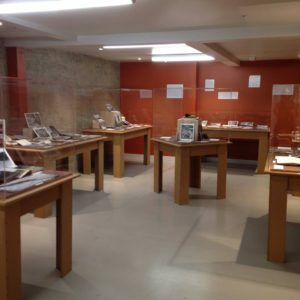 Admission to the exhibit is free.